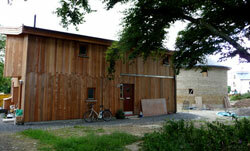 Permaculture Design: Our permaculture offerings include sessions on natural building particulary cob. Join us in The Green Room on the 21 May 2015. This is the Green Building networking opportunity of the year. As ever the Irish Green Building Council is putting together a top line up of National and international speakers. The conference will be opened by Minister for Communications Energy and Natural Resources Alex White who will update us on latest Government initiatives and launch the Build Upon project. With the industry in recovery we get a chance to look at what is on the drawing boards. Has the recession changed attitudes to sustainability? Has the level of ambition increased? We look at the most exciting projects in planning or reaching completion. Read more on the IGBC website. NZEB – Open Doors Ireland is seeking Exhibitors for the 7 – 9 November 2014 event. If you are building or have designed or live or work in a low energy building, Energy Action Limited would be delighted if you would consider participating in the second Irish Nearly Zero Energy Buildings – Open Doors event. During the weekend of the 7th – 9th November 2014, owners of low energy houses and public/ commercial buildings around the country will open their doors for this event. We hope to attract many visitors interested in either building a low energy project or upgrading their house or work environment to a nearly zero energy standard. Last year, over 800 people visited more than 60 houses and public buildings during the NZEB Open Doors weekend.